My journey towards greater sustainability, food independence and greater closeness with my family. Whew! That's what I call hard work. So much easier at the old house where I just threw up raised beds and presto garden space. Well it wasn't nearly that easy, but a decade later it seems that way. Boy I miss that garden. This one pales in comparison, but it will work for this year. Again had the help of one of my sons. The other has a full day of 2 performances. Just enough time after I dropped him off for the matinee to finish digging up the sod. Along the way I had a marvelous idea. So I think. Instead of putting all the sod on the compost pile, why not turn it over in the garden beds and let it decompose in place? Sure hope it doesn't take long. Might research that. Anyway, it sure went faster, instead of brushing all the dirt out of the sod we just left it all in the bed. I think it looks great! The beds aren't perfect, but they will have to do for now. I need to get planting. Here is a close up of the bed. What do you think? Good or bad idea with the sod? Going to have the kids aerate the soil so it is fluffy for planting. Boy a roto tiller would have come in handy. Oh well, we sure got a good workout. Couldn't help but notice the blueberry plants leaves starting to grow. Cool but scary since I should really have seeds in the ground. 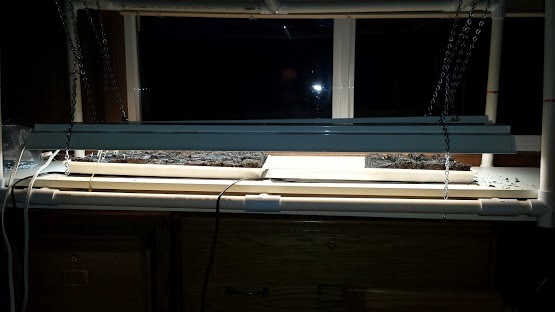 Not sure if I have time to start the seeds indoors this year or if I should just plant them in the beds direct sow. What project did you tackle this weekend? With the snow from a few weeks ago a distant memory and the PNW experiencing a few record days of 70 degrees, it got my gardening juices flowing! So despite this being a very busy show weekend for my youngest and me working back stage, we took some time to dig out the garden area. Didn't get it all finished as the electric tools all broke so we did it all by hand. Decided on three 4x8 beds with a 3 foot walkway between them so I can sit and garden comfortably. The can of field line spray paint came in handy. The boys were a big help though it was clear they weren't strong enough to swing the heavy pick axe. While working it became clear that this area really is the best spot in the yard for a garden. We all worked very hard. Along the way we ran into a problem as to where to put the sod we took out. If I had a roto tiller I could have mulched it up and made use of it as compost. Instead we had to do it the slow way. Dump the sod in a pile with some browns and let the chemical reaction work its magic! So I started a compost pile. Didn't think I'd be doing that so soon. And since I don't get the paper (well I do electronically) I used lint from the dryer. It has a ton of cat hair in it Perfect browns! In the end we decided to call it a day. We were all tired and my youngest was bummed that he was working on his only day off in weeks. The show must go on! So this is how far we got. Maybe I'll work more on it tomorrow morning before taking him to perform. Not bad progress by hand. We had a pretty good system down at the end. The slowest part was getting the sod out of the way. It took a while as I wanted the most dirt possible to remain in the beds. It will mean less compost to buy. I'm happy we got out in the yard and worked in the garden. With theater commitments it has been hard. Ah the life of a father. Have you been able to work in your garden this Spring? Oh yes, Happy Springtime! Sitting next to my stove heater reading my new Territorial Seed catalog on a blustery snowy winter winter weekend has got me thinking about gardening this spring. I'm sure I'm not alone. It's been a while so I'm going to cheat and pull out my old seeds and repurchase the ones I like. Maybe I'll try a few new ones. They all look so good. Unfortunately Mother Nature has put a crimp in my plans to build a garden here. Last week we got 6 inches that tried to kill my mature blueberry plants. I figure they must be 30 years old. 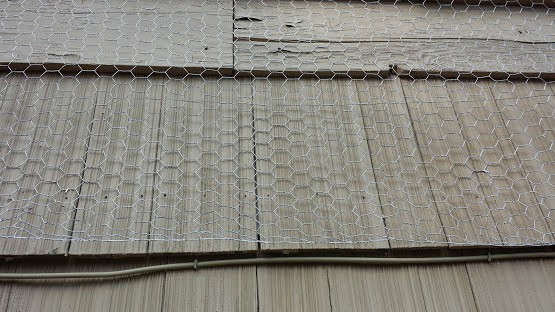 The PVC cage and bird netting collapsed under the weight. Thankfully it melted enough for me to dismantle the cage before another storm hit. They look much happier just dealing with 8 inches of new snow. Stay warm and dry this winter, and plan your own garden. I am in the midst of a divorce after 21 blissful years married to the love of my life. She doesn't love me anymore. As gut wrenching as that is, you have to take solice where you can. For me that is my kids, hiking and gardening. I just moved into my new home with one key item on my house hunting wish list fulfilled... a back yard with a clear southern exposure. Perfect for a few garden beds tucked into the side of my yard I won't use often. A few beds is all I need as I again intend on following the intensive gardening techniques I learned from Mel. So now I sit in my living room waiting for the cable guy to show up and give me WiFi, thinking and planning my garden for the spring. I'm also waiting for my copy of the Territorial Seed catalog! Can't wait to dog ear those pages and restock my garden supplies. What are your favorite catalogs? I know it's been years since I updated this blog. Life has taken me in other directions, but my situation has changed and I'm excited to garden again. If I do pick up a shovel and some seeds, I will take you along with me. You will see some things have changed and some have not. For the winter I plan to set up my seed starting system and browse the Territorial Seed catalog. 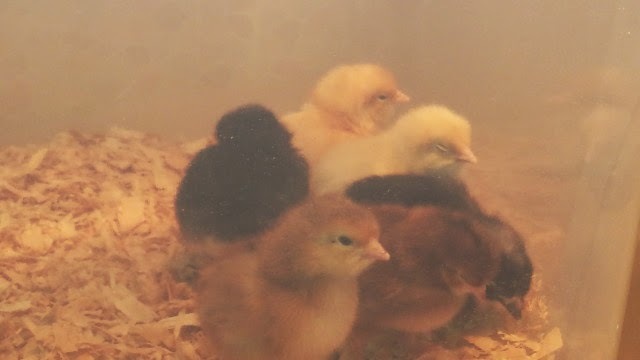 That's right, the chicks arrived, two days sooner than expected. Guess the poor postal service didn't like all that peeping. Hehe. We here at the farm sure do though. It's music to our ears. And without further ado, here are the girls, tired from the move. 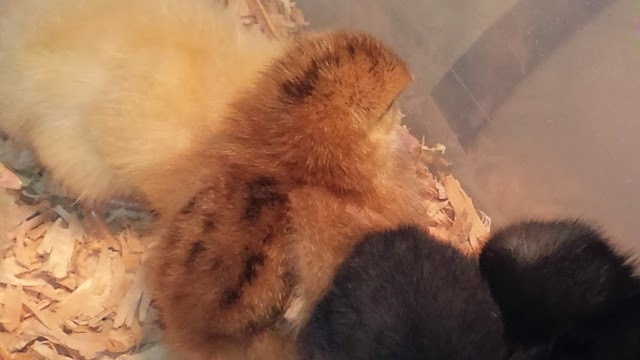 I did move the heat lamp down a bit just in case, but I think they are just getting used to their surroundings. Here's a good pic of them not through the murky Rubbermaid container. 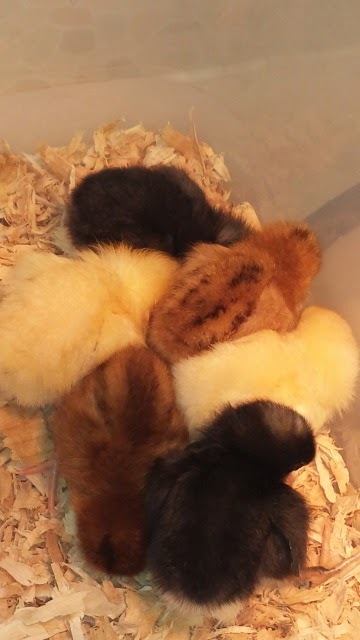 The kids want to name them again. I let them as they're ok with the fact that they're not long for this earth. 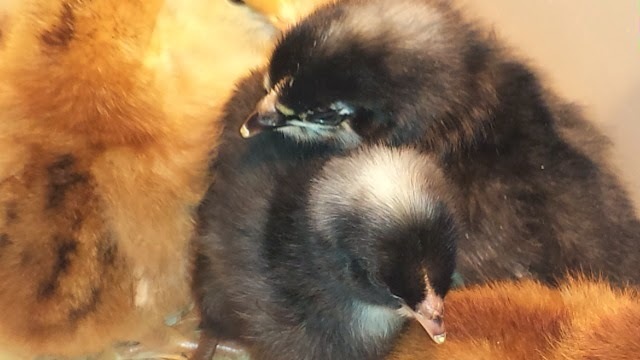 Speaking of which, the two remaining hens aren't laying still, so they may not be long for this world either. 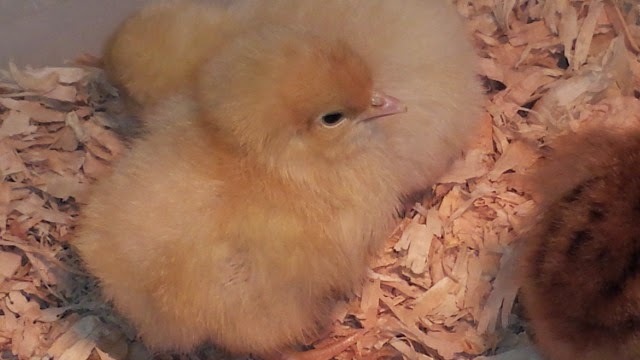 Anyway, here are some close-ups for those of us that just can't get enough chicks. As everyone knows, spring has sprung. The days are getting longer and even in the Pacific North Wet the days are getting brighter. Bulbs are blooming and trees are budding. Even our fledgling fruit trees have buds and flowers on them. My wife wants to let them fruit, but I'm in favor of continued growth of the tree which would mean snipping the flowers so all the energy goes into growth. Ah well, she'll win out so why do I bother. Well, some of you may have read about my scout Pack Meeting activity with soil blocks. Well the next weekend (last) I broke out and made a bunch of my own. You can see below that I packed them in as tight as I could on the left. The only challenge I've seen with doing that is the roots growing together, which is no big deal if you just tear them apart. The other thing I recall from prior years is the spider web fungus that grows between the cracks. My research showed it was nothing to worry about, so I don't. 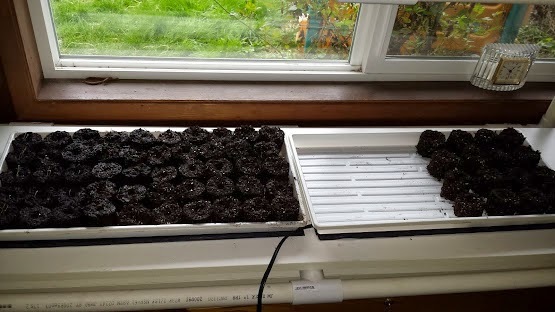 Anyway, as you can see in the far left of the picture, the initial plantings from the night of the scout meetings sprouted fast with my new heating pads (black pad under the white trays). They work very well if I say so myself. A thermometer between the tray and pad was 90 degrees. Not bad for $25 each. Gotta love Amazon Prime. I digress. You can see the sprouts reaching for the sunlight. I had to fix that quick or they'd get leggy. So out to the garage I went and hooked up my lights. I had to buy new chains and S-hooks because they got misplaced in the garage. So I'm about $100 into my garden hobby this year. Oh well. The stress relief alone is well worth the cost. Thankfully the PVC frame held up like a charm. Below you can see it all hooked up. Looks like I bought too much chain. Oh well. The other thing that happened this weekend is that we had an unwanted house-guest. No, not my mother-in-law, we love her to pieces. It was actually a woodpecker. Dumb bird kept waking up my son as it was pecking right below his window in the garden area. I didn't take a picture of the first hole that went all the way through to the attic, I just covered it in a hurry on the way out the door to the theatre. The wood is salvaged from the floor we replaced in my son's room. 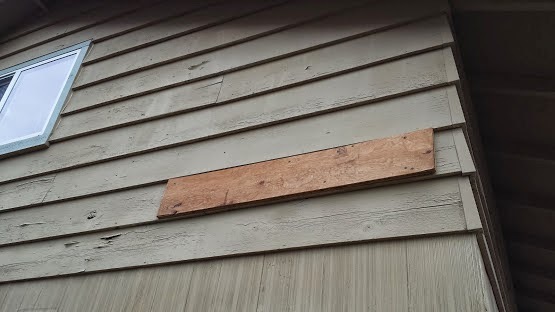 Going to need to weatherize it if I don't replace the siding on that side of the house, but that'll be very expensive. Unfortunately it just made the woodpecker move over... and start pecking right into my son's bedroom! That call made me drop what I was doing at work and run home. Thankfully I found the bird hadn't gotten through to the drywall. You can see the black tar paper. It's not horrible. But I had had it. I needed to go to drastic measures. 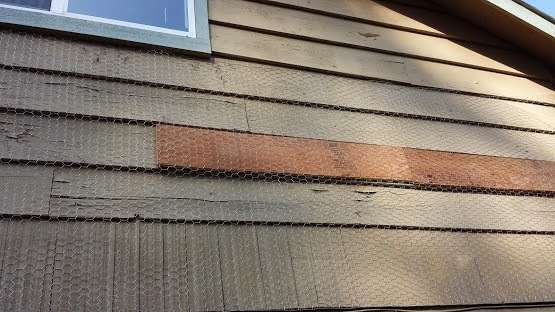 Not only did I put another board up, but I stapled up temporarily a 4 foot swath of chicken wire. Boy was that a process, two stories up. We even had my youngest hanging out the window (blocked by a ladder) holding up the wire while I stapled it in place. Here is a close-up. My wife didn't think it would deter the bird enough, but an hour after I wrapped up, what did I hear? 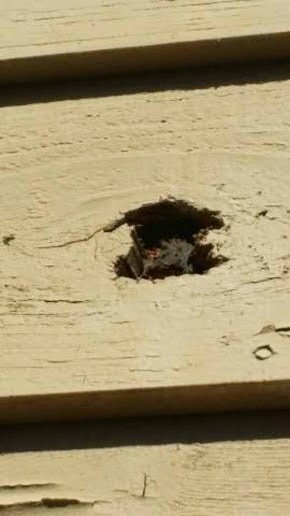 A woodpecker pecking a few houses down. Not that I wish that on anyone, but come on! After that we went on a nice spring walk and grabbed Subway for dinner. Great to see so many neighbors out weeding or just going for a walk. Gotta love spring! Welcome to my continuing garden adventure here in the Seattle area (Zone 8b)! 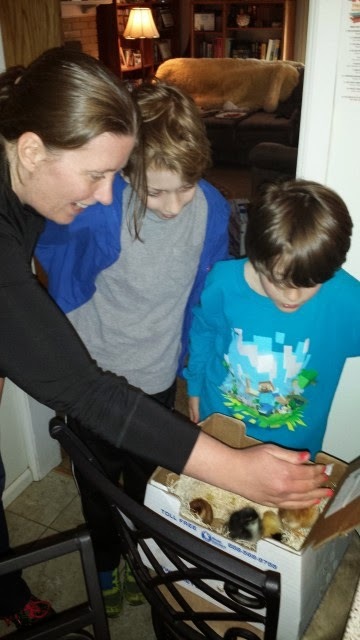 In my early 40s, I hope to improve the quality and variety of the food we serve our family. My elementary school-aged boys help me to grow better food all year long. I am excited to learn more about gardening and a simpler life and pass that knowledge along to future generations!